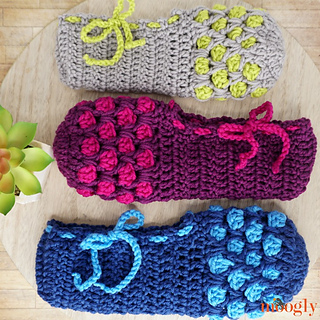 The Chic Moroccan Slippers are cozy, quick, and snuggly warm - and a free crochet pattern in 3 sizes on Moogly! 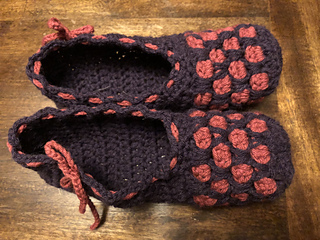 Designed on a reader request to match the other Moogly Moroccan Tile Stitch patterns, the Chic Moroccan Slippers crochet pattern includes 3 sizes - based on women’s shoe sizes, the Small fits a 5/6, the Medium fits a 7/8, and the Large fits a 9/10. By simply changing the hook size used, you can make this pattern fit most women’s feet. And the only difference between the right and left feet are the placement of the tie - which you can put wherever you want! Made with super squishy Red Heart Chic Sheep by Marly Bird, each pair takes less than 1 skein of each color - making this a great go-to pattern for gifts for the holidays! Right and left-handed video tutorials included!